Scunthorpe made it three straight wins as they edged past in-form Southend. 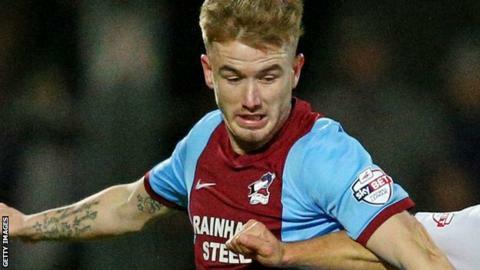 Iron's top scorer Paddy Madden netted the only goal of the game when he headed in his 17th goal of the season. Southend's Dan Bentley made a succession of saves to keep the score down as the visitors struggled. The Iron's Murray Wallace headed against the bar in the second half as Scunthorpe remain unbeaten under the charge of joint caretaker bosses Nick Daws and Andy Dawson. "I thought we started the game really well - all parts of our game came together today. "I thought we defended brilliantly, we moved the ball really well, and we did exactly what we worked on in training during the week. "The two outstanding saves that Dan Bentley pulled off in the first half just indicated why clubs want to pay whatever they want to pay for him." Match ends, Scunthorpe United 1, Southend United 0. Second Half ends, Scunthorpe United 1, Southend United 0. Attempt saved. Gary McSheffrey (Scunthorpe United) right footed shot from the right side of the box is saved in the top left corner. Noel Hunt (Southend United) wins a free kick in the defensive half. Attempt missed. Adam Thompson (Southend United) right footed shot from outside the box is close, but misses the top left corner. Neal Bishop (Scunthorpe United) wins a free kick on the right wing. Substitution, Scunthorpe United. Scott Laird replaces Conor Townsend. Substitution, Scunthorpe United. Gary McSheffrey replaces Luke Williams because of an injury. Substitution, Scunthorpe United. Jordan Clarke replaces Scott Wiseman. Jamar Loza (Southend United) is shown the yellow card. Delay in match Neal Bishop (Scunthorpe United) because of an injury. Attempt saved. Luke Williams (Scunthorpe United) right footed shot from outside the box is saved in the bottom right corner. Attempt missed. Murray Wallace (Scunthorpe United) header from the centre of the box is close, but misses the top right corner. Luke O'Neill (Southend United) is shown the yellow card for a bad foul. Foul by Luke O'Neill (Southend United). Attempt saved. Noel Hunt (Southend United) right footed shot from outside the box is saved in the bottom right corner. Murray Wallace (Scunthorpe United) hits the bar with a header from the centre of the box following a set piece situation. Attempt missed. Paddy Madden (Scunthorpe United) right footed shot from the centre of the box is close, but misses to the right.